08.19.18 National Chess Master and two-time Maine State Chess Champion Alan Schalk will hold a free Simultaneous Chess Exhibition at the Wagon Wheel Campground in Old Orchard Beach starting at 1:00 p.m. on Sunday, September 2, 2018. Come out and try your skill against National Chess Master and two-time Maine State Chess Champion Alan Schalk at a Simultaneous Chess Exhibition on Sunday, September 2, 2018 in Old Orchard Beach, Maine. 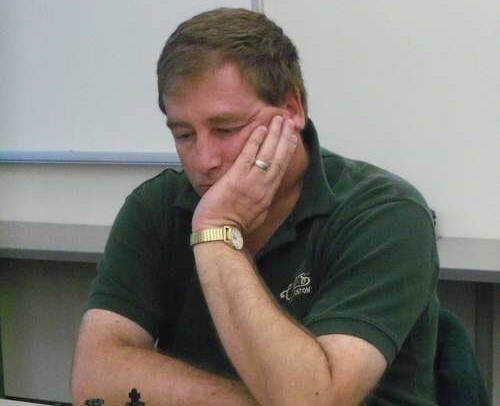 National Chess Master and two-time Maine State Chess Champion Alan Schalk will hold a free Simultaneous Chess Exhibition at the Wagon Wheel Campground in Old Orchard Beach starting at 1:00 p.m. on Sunday, September 2, 2018. Players should bring chess sets as there are very limited supplies available. Pre-registration or sign-up is not necessary. Rules of play: Challengers will set-up their boards with the challenger playing the black pieces. Challengers should only make their move when Alan appears at the board. Challengers are allowed a single pass if they are not prepared to move when it's thier turn during play. Quiet consultation between players is okay. No computers. This is amazing. The thought process and the skills one should be having to play multiple chessboards is a lot higher. I can barely play a game of single board chess. Anyway, I am looking forward to watch him playing. This is a great way to get people excited about chess. I'm sure there are a lot of young kids who will really enjoy this.